Mission San Luis Obispo de Tolosa. Courtesy of Santa Barbara Mission Archive-Library. Located in Central California, Mission San Luis Obispo de Tolosa is named after Saint Louis, Bishop of Toulouse, and was founded fifth in the chain on September 1st, 1772 by Father Junipero Serra. The mission was founded three years after the fathers first discovered La Cañada de Los Osos – the Valley of the Bears – during a failed trip from San Diego in search of Monterey. As supplies dwindled in 1772 at the already established four missions of California, residents were plagued by shortages of food. Remembering the Valley of the Bears, a hunting expedition was sent in the summer of 1772 to bring back meat. The local Indians were thankful to the soldiers for killing the bears, a feared enemy. Some of the meat was traded with local people in exchange for edible seed, after which time Father Serra decided La Cañada de Los Osos would be an ideal place for the fifth mission. Although the city of San Luis Obispo has not remained a rugged bear country, a statue of a grizzly bear sits as reminder in the mission plaza. In 1776, four years after its founding, an Indian fired a flaming arrow onto the roof of one of the mission buildings, starting a disastrous fire that severely damaged several buildings. After this incident, the fathers began work on making roof tiles locally, to reduce susceptibility to fire. As the city modernized, so did the mission. What was once the fathers’ soup kitchen is now this youth center. 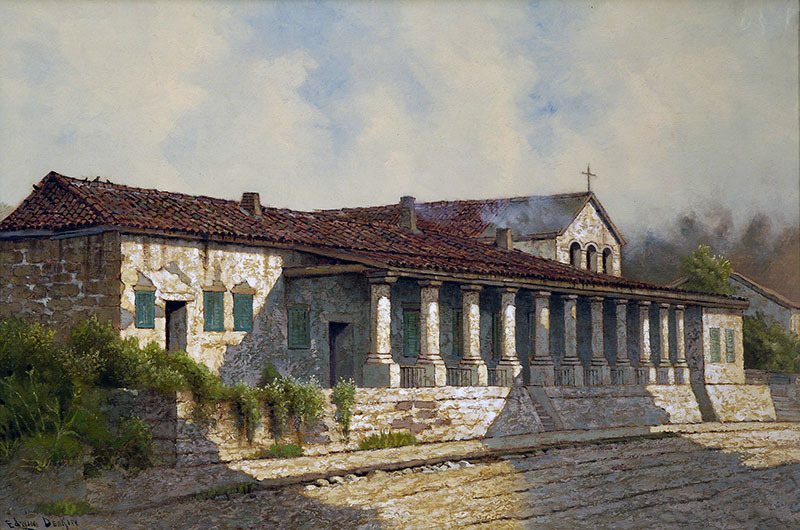 Mission San Luis Obispo is one of the only missions that never had to relocate; it still stands on its original site. The mission’s walls, which are 50 to 60 feet high, were built according to Vatican law. This law stated that churches were to be built as tall as the local tree – in this case, the pine. The church, with a long secondary nave forms an L-shaped church, the only one of its kind amongst the California missions. Northbound: From US-101, exit onto Broad Street. Turn left on Palm. The mission is on the corner of Palm and Chorro. Southbound: From US-101, exit Monterey Street, which ends at the mission. Parish Office hours: weekdays 9a - 5p. Please call 805-543-6850 for further information on visiting the mission.